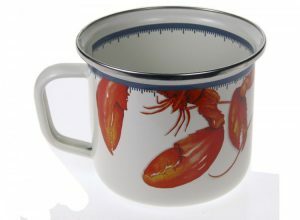 Kitchen accessories including fine imported vintage style enamelware dishes & teapots and fine imported items of vintage white enamel beverage dispensers, enamel mugs, folk art storage boxes, Hoosier pumpkin jars with stand, enamel popcorn bowls and ceramic rooster creamers, Stoneware Tea set mug,marbled enamelware roasters, splatter ware dishes, star salt & pepper napkin caddy, mason jar salt & pepper shakers, Olde kitchen tins, tea pots, mugs, primitive rustic faucet towel holder, planter stands and hand painted napkin holders and other items made in the USA. 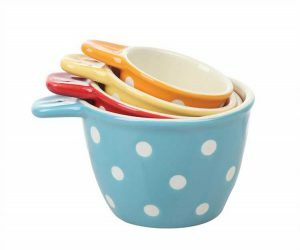 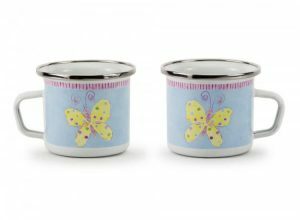 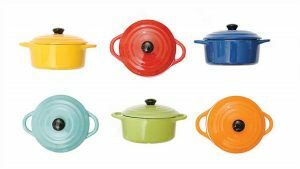 Add a splash of color to your kitchen with Creative Co-op Ceramic Measuring Cups w/Polka Dots, Set of 4 and a colorful polka dot stoneware butter dish. 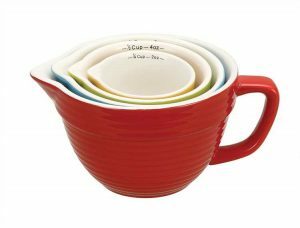 Serve soups or beef stews with stoneware mini bakers by Creative Co-op. 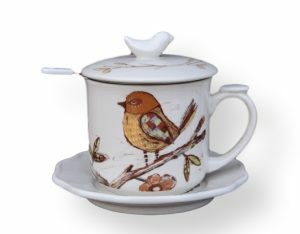 Dress up your morning toast with honey from our stoneware honey pots. 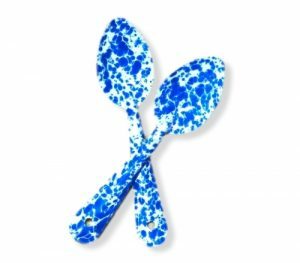 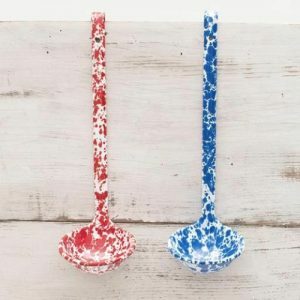 You will find many uses for this large spoon. 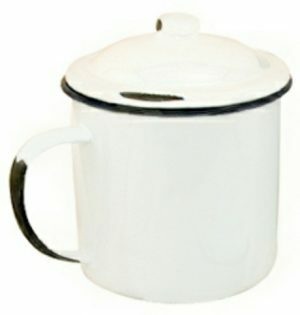 I use it daily because of the size. 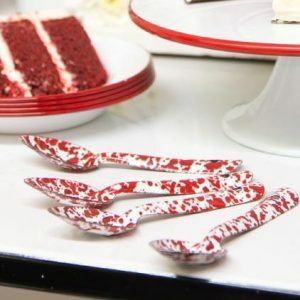 This spoon measures 6 inches and is the perfect size for deserts. 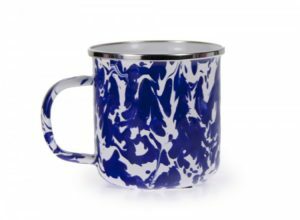 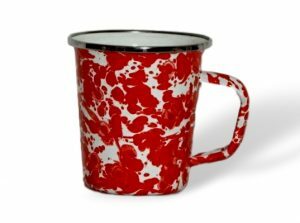 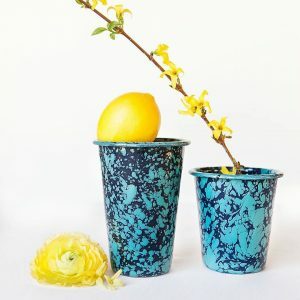 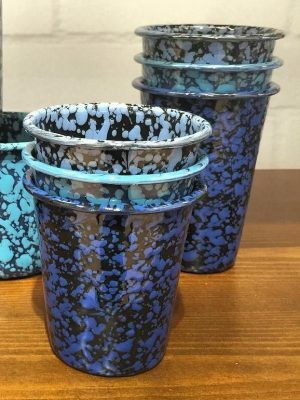 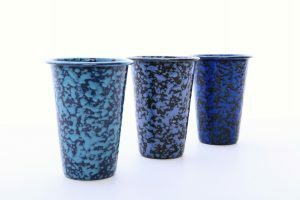 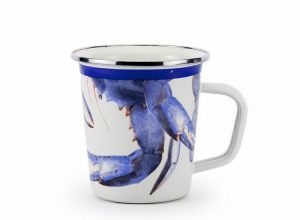 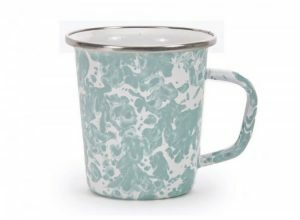 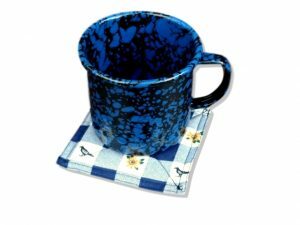 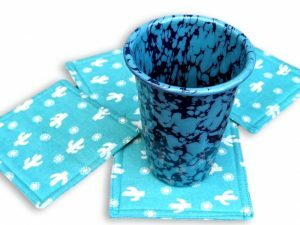 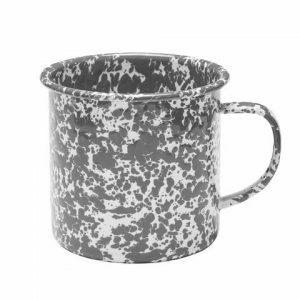 Splatter ware marbled enamel tumblers hold 14 ounces. 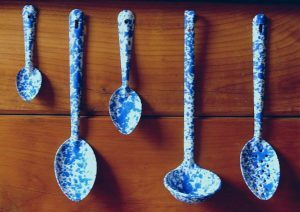 Slotted spoon shown on right in photo. 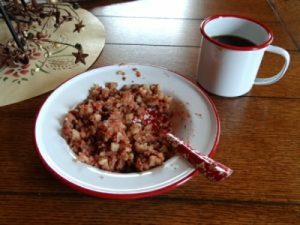 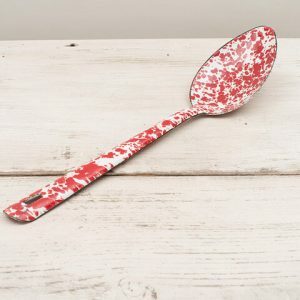 This medium sized enamel spoon is a good serving spoon for mashed potatoes. 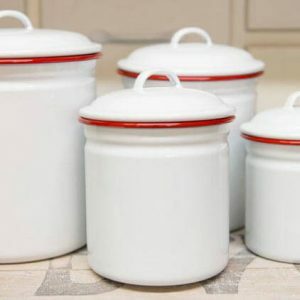 Vintage white enamelware canister sets by Crow Canyon Home are a great addition to any kitchen. 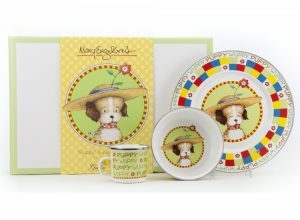 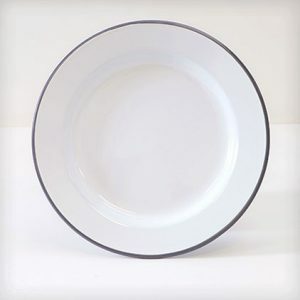 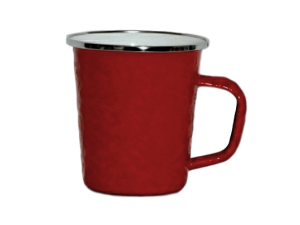 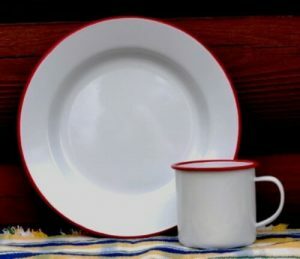 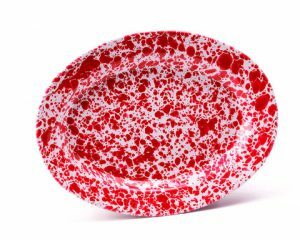 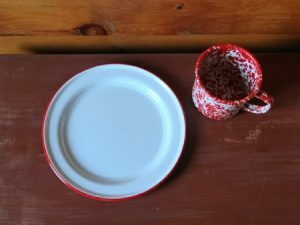 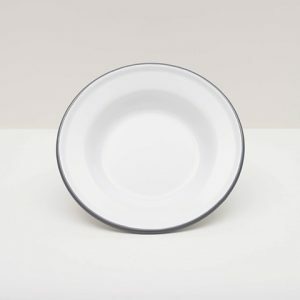 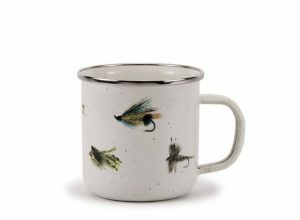 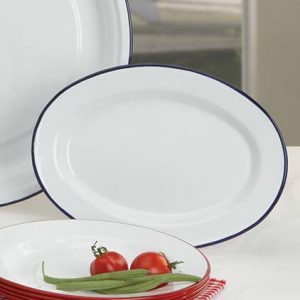 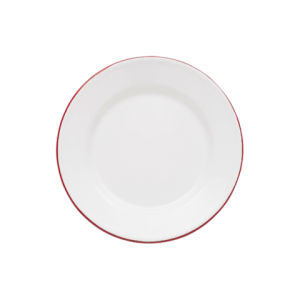 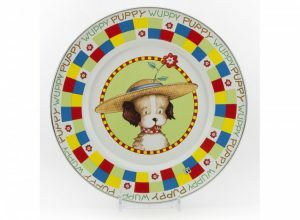 Collect – Dishes, bowls, bake ware and more. 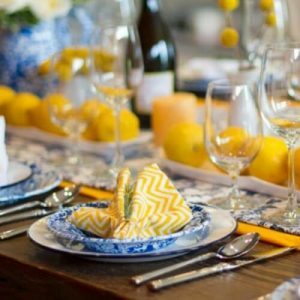 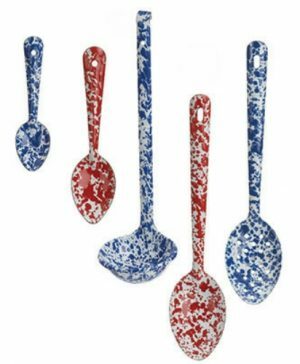 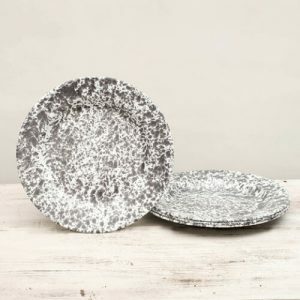 Mix and match with splatterware. 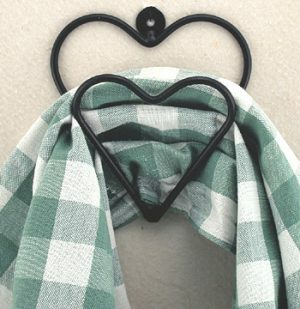 This metal swag hook can be used for hanging curtains, towels, candles and other items. 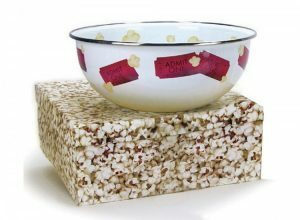 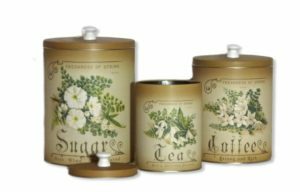 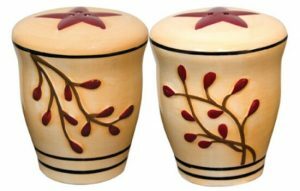 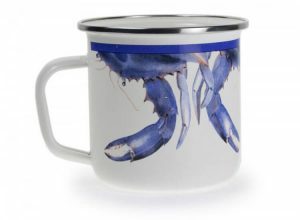 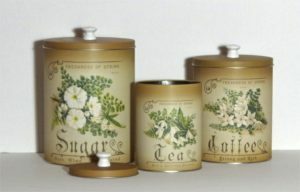 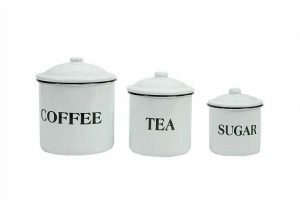 This 4 piece enamel canister set has a splatterware marbled finish. 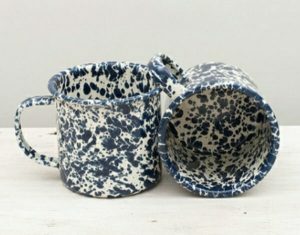 Cream & sugar set made of stoneware. 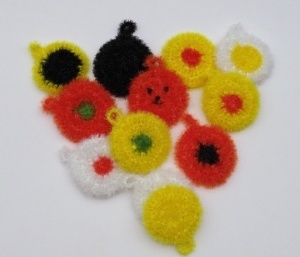 by Creative Co-op. 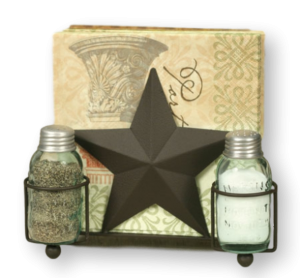 The vintage style of these clear glass Hoosier salt and pepper shakers will add a nice vintage touch to your table. 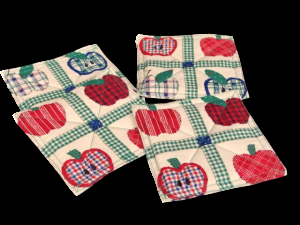 The squared shape fits just right in your hand making easier to grip. 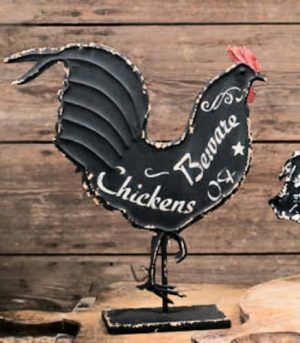 This primitive metal rooster is just the right accent for your country kitchen or farmhouse decor. 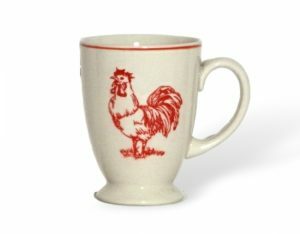 It says, Chickens Beware Rooster and has a antique worn look. 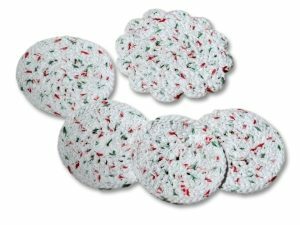 These soft dish scrubbies make doing dishes fun. 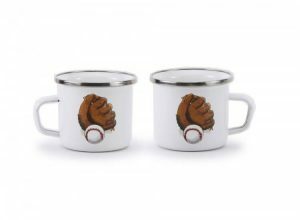 They make great gifts too. 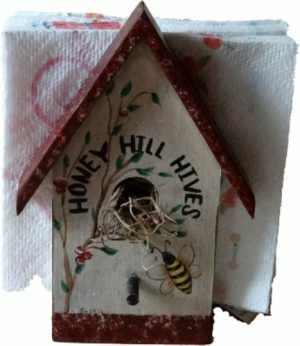 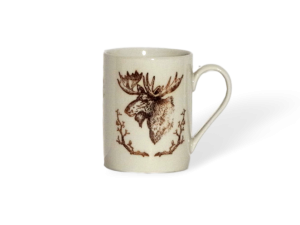 Hand crafted and painted in the USA. 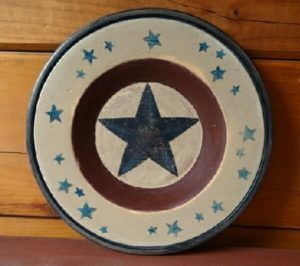 in acrylic paints and antiqued to look aged. 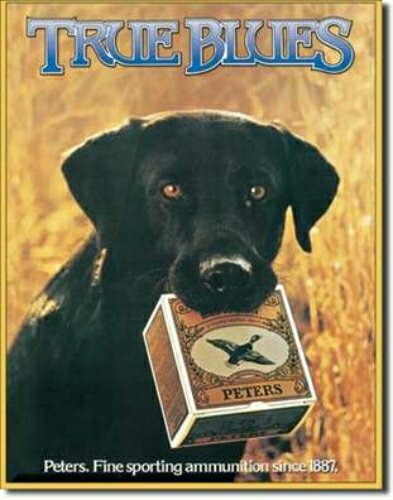 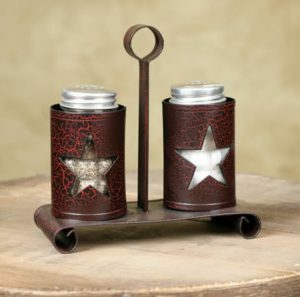 These Olde Country tins have a primitive style with antique charm. 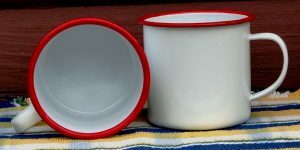 Colorful batter bowl style measuring cups are a great gift idea. 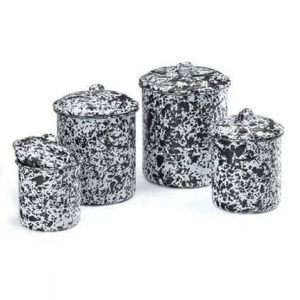 Go from oven to table with these versatile covered stoneware mini bakers. 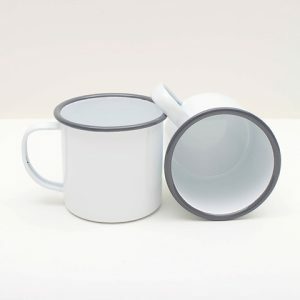 They are also microwave and dishwasher safe. 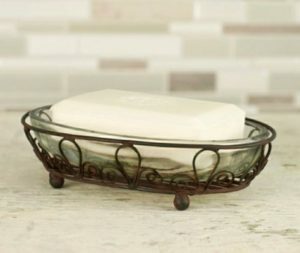 Vintage style oval soap dish with glass liner inserted into a wired rusty colored holder. 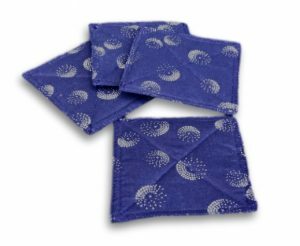 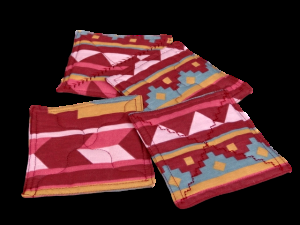 Protect your furniture with hand-crafted fabric coasters, in several colors to enhance your decor. 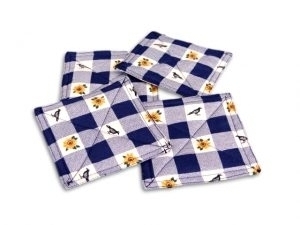 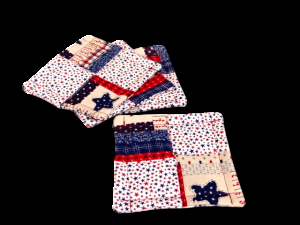 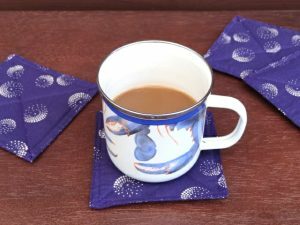 These hand made fabric coasters have an Americana print that can be used all year long. 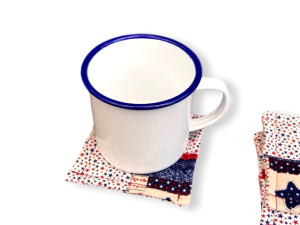 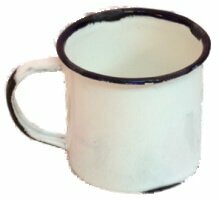 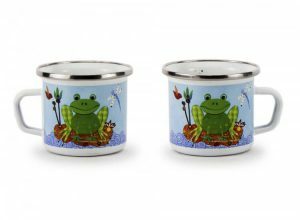 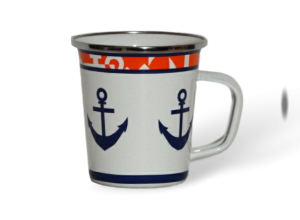 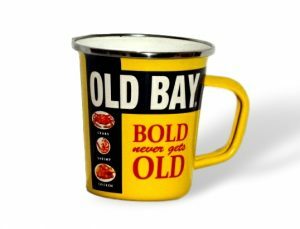 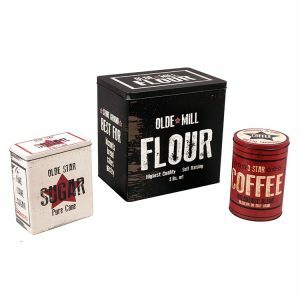 You will love serving drinks with these hand crafted coasters which are extra large for holding 20 ounce jumbo enamel mugs. 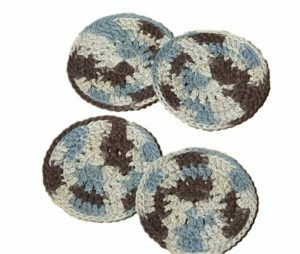 You will love these hand made coasters with colors of blue and brown. 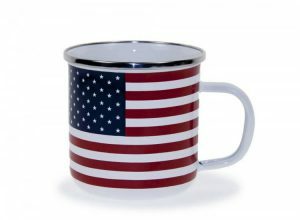 These were hand made here in the USA. 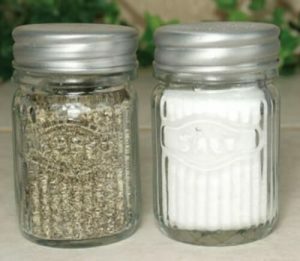 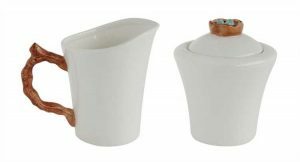 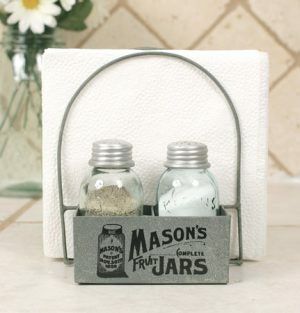 You will just love the shape of these Mason Jar glass salt and pepper shakers and the caddy which is also a napkin holder. 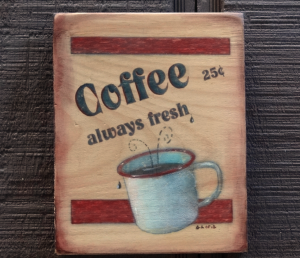 Hand crafted Coffee sign, made in USA by Americans. 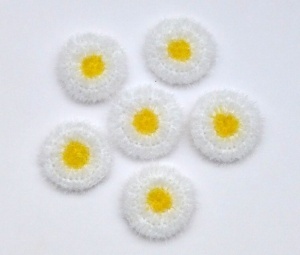 Hand crafted crocheted coasters made in USA not imported. 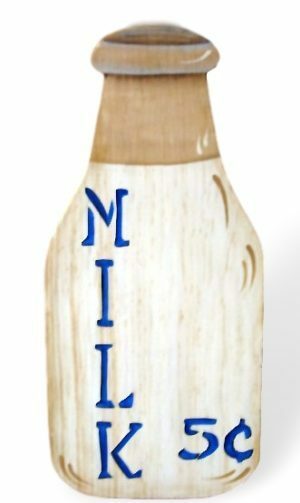 If you want quality buy hand made. 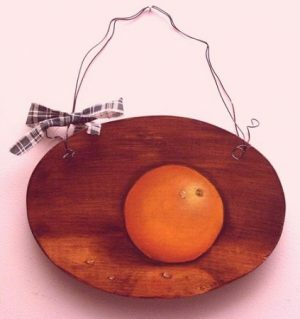 This is an image of an orange that was hand-painted on wood with oils. 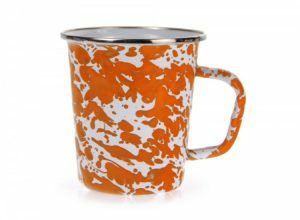 Take note of the reflections in front of the orange. 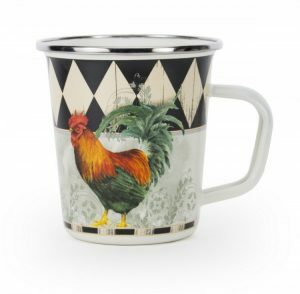 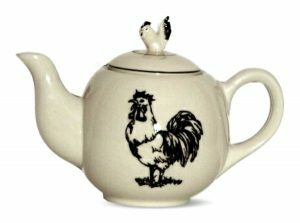 Add this teapot to your farmhouse collection of roosters or start one.